Building a viable gaming pc may seem like a lofty goal, however, you can build a decent pc worthy of gaming. 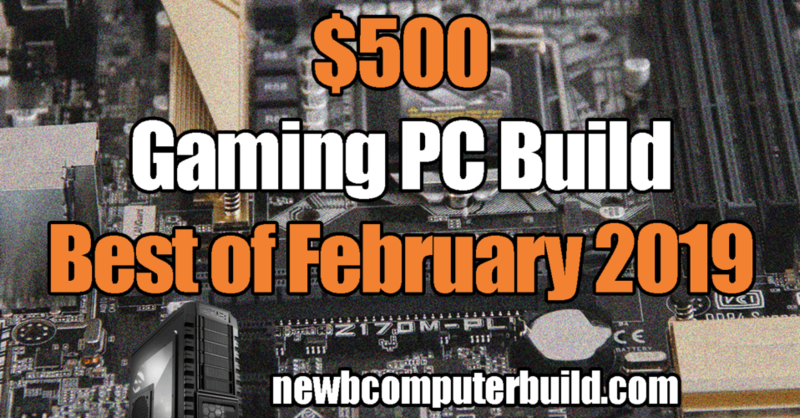 Here is the best $500 gaming pc build for February 2019. $500 is for those builders who just want to build a no-frills pc and just get up and playing the games they love. In the $500 budget range, you can expect to play PC games scaled down at 1920×1080 resolutions, with room for upgrades. If you are looking to get a gaming pc at the best possible cost that is capable of 1080p gameplay, then this is it. The best $500 gaming pc build for February 2019 uses an Intel i3 8100 CPU, and a GTX 1050 3Gb graphics card — those purchasing this build should expect to play PC games with slightly scaled back game settings well at 1080p resolutions. Overall, this is a solid best bang for your buck $500 gaming pc build for Janaury 2019. And plus, this will beat any console out there! Looking for a Different PC Build Budget? The CPU used in the $500 February 2019 Gaming PC Build is the Intel i3 8100. This CPU is one of the best budget cpu’s out there and provides a very balanced performance profile for gaming at a great cost. The 8100 has four cores with a base frequency of 3.6Ghz. Overall, this is a very competative cpu in the budget pc market. The graphics card included is a GTX 1050 3GB card. The GTX 1050 can provide a gamer with smooth 1080p gameplay with some reduced settings in your games — what this means is that no a $500 gaming pc won’t max all games out at standard HD resolutions, but it is 100% playable if you scale those settings back a bit, of which will garner your the best FPS possible. Do make sure to get the 3GB version — as this is a newer card and will providebetter performance than the 2Gb counterpart. The RAM included is all you’ll need for this build, which is 8GB of DDR4 RAM with a Corsair LPX 8GB kit. For storage, this build includes a modest 120GB using a Kingston A400 120GB SSD. The positive is that this is a very affordable SSD however, you may run out of space faster than you think. Should you want more storage right off the bat, it isn’t too much more to bump up to a 256GB SSD, so you could consider upgrading to the 240GB or higher versions instead, or simply add in another later on when you run out of space. DOES NOT fit ATX motherboards – ONLY fits Micro ATX and Mini ITX motherboards! The above are options should you have a greater budget than $500, or if you want future upgrade ideas when you eventually feel the need. The CPU upgrade suggested is an Intel i5 8400, which is a nice bump over the included i3 8100, so if you have the funds to do so, this may be a worthy upgrade for you. If you simply want the biggest bump in gaming performance, then you could consider upgrading the graphics card to an AMD RX 580 graphics card, which is a fantastic card that will guarantee higher settings in pc games at 1080p. As stated previously in this build article, the included storage is a little small, so if you think you need more than the included 120GB, you could simply bump up the capacity to the 240GB version of the Kingston A400 SSD for roughly only $10 more. The budget $500 gaming pc build is a perfect PC for those who just want to get a cheap gaming PC and to just get up and playing their favorite PC games. The beauty of building your own PC, is that you can always swap hardware in the future to upgrade or get specific hardware that matches your style and tastes. If you are interested in learning more about what other budgets can get you, then check out the other builds here at Newb Computer Build or simply leave a comment below if you have any questions. Questions or comments? Feel free to leave them below!